Description: Deciduous shrub to 2.5 m high, stems glabrous. 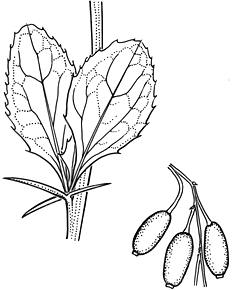 Leaves on main stems reduced to terete spines, usually deeply divided into 3, each 10–25 mm long. Leaves on short shoots obovate to elliptic, 2–6 cm long, 8–25 mm wide, apex obtuse, margins regularly toothed with numerous bristly teeth. Racemes terminating lateral shoots, many-flowered, numerous, each 5–7 cm long and pendent in fruit; pedicels c. 10 mm long. Flowers c. 5 mm diam., perianth yellow. Berry oblong to ovoid, 9–12 mm long, bright red, stigma ± sessile. Distribution and occurrence: cultivated in cooler regions, rarely naturalised. Native of Eur. to E Asia.